I discovered the other day, after planning what I thought was a good trip a couple of things. So, it turns out that all this extra planning had become too hard, expensive and ruined ‘idea’ of the trip. The solution, which I am very happy about, is to not stop in Darwin. 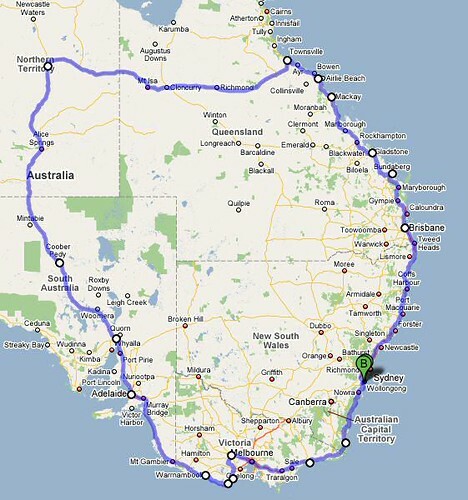 I have decided to do the trip as planned till Alice, then ride with no fixed distances or stops until I get home. Of course I have a path in mind. Most of the southern part has been well worked out to a high level of detail but after Alice, its more of a guide than a plan. I’m quite excited about just being able to ride every day until I get sick of it, then find somewhere to stop. I will have a tent and all required camping equipment so I can either find somewhere to stop off the side of the road ,stop in a hotel or anything in between. I have allocated 2 extra weeks for the return part of the trip and it should be easily do-able. Now the trip has almost doubled in distance (from the original version where I did lots on a train) but it seems very exciting. I will have a mapping GPS with me so any changes in destination for the second half of the trip shouldn’t be a problem. I would still like to head to Cairns (I don’t know why) and would also like to visit Longreach. I guess I will just have to see how the time is going and how I feel if I get there or not. Having just finished the book ‘Long way round’ and am currently reading ‘Long way down’ I am really in the mood for some adventure. The only downside is being alone which has its good and bad points. I also have both of these series on DVD as well as the Charlie Boorman ‘race to dakar’ series. All very inspiring stuff. I’ve been doing lots of touring reading lately and the basic rule seems to be that the longer the troup, the smaller the group you would be able to tolerate. Maybe its good to go alone but I still think if one of my friends wanted to come along, it would be much more enjoyable. This is the planned route. Wow Kevin, good on you! I can never understand males and their need to ride/drive long distances! 9000+kms in just over a month… sounds like too much time on the road to me! David at SS went on a road trip last year with his bro (until Pete came off his bike in WA and then he went it alone). If you haven;t already asked him, I’m sure he’d love to swap war stories. Enjoy your ride, might even see you in Tennant! I’d be happy to catch up and see how your trip is going.